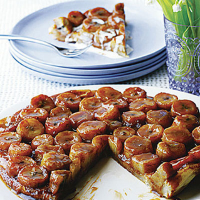 Made with bananas and toffee sauce, this easy alternative to a traditional tarte Tatin will be sure to go down well with all the family. Preheat the oven to 200°C, gas mark 6. Lightly grease a 24cm round cake, or tarte Tatin, tin. Unroll the pastry and cut out a 24cm diameter circle to fit the tin. Peel and cut the bananas into slices then lay them inside the base of the tin. Pour over the toffee sauce, covering the banana evenly. Place the circle of pastry over the bananas, tucking the edges loosely round the edges of the tin so that steam can escape. Bake in the oven for 20-25 minutes, or until the pastry is puffed and golden. Remove from the oven and allow to stand for a few minutes to cool slightly. Using an oven glove to protect your hands, place a serving dish on top of the tin and, holding them firmly together, turn the tarte upside down. Carefully remove the tin. Scrape any remaining sauce in the tin over the tarte Tatin. Serve immediately with chilled Waitrose Select Farm Single Cream or a generous scoop of Waitrose Madagascan Vanilla Ice Cream. Pour the toffee sauce over apple slices before adding the crumble to an apple crumble. Once opened, refrigerate the sauce and use within 2 days. Muscat is the perfect sweet white wine for this indulgent dessert.